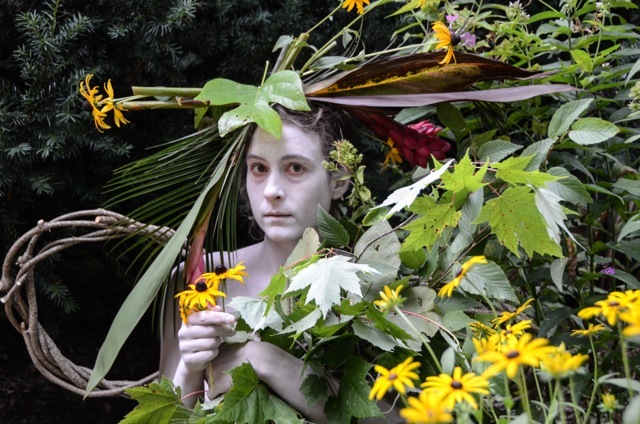 Butoh Garden Party this September! Please join us in September for live music and Butoh dance, a silent art auction and some lovely wine! Enjoy live performances by yours truly of strange daughters butoh, Elisa Faires, Julie Becton Gillum, Monika Gross, Geo Lynx, Erik Moellering, Kima Moore and Megan Ransmeier as well as a silent art auction and exhibit of works by Sandee Johnson. Proceeds benefit UWABE- Art in the Park, free Butoh dance performances in Asheville parks this October. The production is by Anemone Dance Theater and Legacy Butoh and will feature works by local Butoh artists as well as guest choreographer Vanessa Skantze from Seattle. The Garden Party will be Saturday Sept. 6 from 5pm-7pm (rain date Sept. 7) in Asheville. For the location and more information please message me on my blog or email saraband@gmail.com. Suggested donation for the party is $20. Megan Ransmeier in a photo by Sandee Johnson.